With rapid globalization, the world is more deeply interconnected than ever before. While this has its advantages, it also brings with it systemic risks that are only just being identified and understood. Rapid urbanization, together with technological leaps mean that we are now physically and virtually closer than ever in humanity’s history. We face a number of international challenges – climate change, pandemics, finance, cyber security and migration – which spill over national boundaries. It is becoming increasingly apparent that the UN, the IMF, the World Bank – bodies created in a very different world, more than 60 years ago – are inadequate for the task of managing such risk in the 21st century. 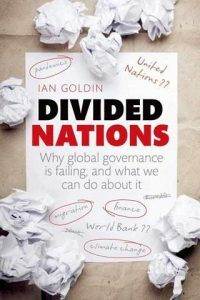 In Divided Nations, published by Oxford University Press in 2013, Ian Goldin explores whether the answer is to reform existing structures, or to consider a new and radical approach. By setting out the nature of the problems and the various approaches to global governance, Goldin highlights the challenges that we are to overcome and considers a road map for the future. Also available in Chinese translation. Divided Nations is now available from Amazon as an audio book. Ian Goldin spoke about Divided Nations at the the University of Oxford’s Centre for International Studies (CIS) on 2 June, 2014.